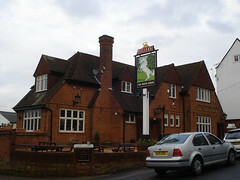 Fuller's pub in South Harrow. The interior is reasonably sized with no internal divisions, but the space wraps around the bar and thus offers a few different areas with different ambience. Near the front is a large alcove-type space with bookshelves and a flatscreen, while around the other side of the bar is a larger area which leads out to a covered patio (with sofa) and down some steps to a traditional beer garden. The decor is somewhat upmarket — polished hardwood floor, matching dark wood furniture, and tones of brown and grey in the wallpaper and paintwork. Kake visited on a Monday afternoon in November 2014. There were a handful of people in when I arrived a little before 2pm, all but one chatting around the bar, and another group arrived for lunch shortly afterwards. Music was playing quietly. One of the three flatscreens was on with the sound off. Ales on offer were London Pride, Gales Seafarers, and ESB. A pint of lime and soda was £1.95. According to a sign seen in November 2014, there's a quiz every Thursday from 9pm. Accessibility: Two small steps to get in, a stride or two apart. Two larger steps to the patio, and more to the rest of the garden. No steps to at least one of the ladies' toilets, but gents' not checked. Last visited by Kake, November 2014. Opening hours taken from the 2013 Good Beer Guide. Last edited 2014-11-24 17:54:49 (version 5; diff). List all versions. Page last edited 2014-11-24 17:54:49 (version 5).